We have a good news, bad news situation here. Sometimes you can indeed fix the problem of a popped out lens of glasses without the aid of a professional. I’ve included two videos on the topic. This second video shows a quick way you can pop in the lens on your semi-rimless glasses from the comfort of your own home! Eyeglass frames are somewhat unique in the mechanical world in that , with few exceptions, they have screws but not nuts. In some rimless frames, there are screws that proceed on through the lens and into capture nuts, and in the case of those screws breaking, or the nuts loosing their internal threads, they can simply be replaced. Unfortunately , in most regular eyeglass frames, that is not the case. Should any of the three common sets of optical screws fail such as the hinge screws, the lens hoop retainer screws or the screws that retain the nose pads in the receiver cups at the end of the nose pad harps, the frame is rendered unwearable. There are two basic kinds of screw repairs in the eyeglass frame world. First, there are instances where the receiver section of the frame has had the threads wear out, and the screw simply will not tighten or will not remain tightened even with a fresh new screw with perfect threads. This is frequently indicated by a customer that complains of a lens screw that constantly requires tightening. In this case, the first option is to drill out the worn threads and tap out the hole to the next largest optical hole size, and supply the next largest size of optical screw. Should the worn hole size already be of the largest diameter that the section of the frame can be safely drilled out to, the repair calls for what has been one of the most common repairs in the eyeglass repair industry: the procedure called Fill, Drill and Tap. In this process, the hole is filled with an alloy, such as an alloy of gold and Monel, and then drilled to provide a new fresh hole of the appropriate diameter to receive a tap that will establish fresh new threads, and then fitted with the correct optical screw. Ironically, although this procedure was a mainstay of eyeglass repair for over a century, and was done by apprentices, it has all but disappeared in general repair practice. FRAMEFIXERS.COM maintains the facilities and supplies to provide the correct drill and tap to restore any threaded receiver section as well as the machining equipment to form the head and thread of any original screw to match original screws on any eyeglass frame. The second and more difficult broken eyeglass frame screw repair problem is the case where a screw is broken off in the frame. his renders the frame unusable and is frequently compounded by incorrect attempts to remove the screw body fragment remaining in the frame. This is frequently due to a lack of experience or understanding of what is required to remove a screw fragment from a threaded hole in an eyeglass frame. Optical screws are typically hardened to a Rockwell hardness of 8.0 or 8.5 or even 9.0. For this reason, trying to drill the fragment out with a steel drill, even one of good quality is fruitless. This results in damaging of the area around the screw aperture, and in the worst cases, which we see frequently, the drill starts a hole parallel to the original, and then breaks off in the frame. This then requires the removal of the original screw fragment, as well as a hardened steel twist drill fragment. Fortunately both can be done easily with the correct equipment and skill. At FRAMEFIXERS.COM EYEGLASS CO, we use a wet slurry drilling technique by submerging the unit in a cooled propylene fluid and a cutting compound of corundum powder or diamondtine powder on a copper wire drill. Such a drill technique will actually drill through a diamond, making the broken frame problem simple by comparison. This is followed by the previously explained process of running a tap of the appropriate optical screw size into the receiver hole, and supplying a fresh good quality optical screw. The frame is then set for return to service and has a reliable mechanically sound repair that is cosmetically fine as well. To watch the full Fill, Drill, and Tap repair of a stripped screw, follow the links! At FRAMEFIXERS.COM we acknowledge the fact that eyeglass repair emergencies can and do happen, and we respect the creative ways in which some customers make a creative and temporary repair to their important eyewear. For example, check out what is possibly one of the most creative ways I’ve seen someone conduct a quick fix for glasses repair! Just like emergency car repair, there are certain things you can do to temporarily keep you from being stranded, and then there are those things that you should never do and just leave it to the professionals. Just in case you’ve decided to admit defeat and send in your glasses, here’s our phone number for free estimates! Screws are a very frequent source of problems, but fortunately, if it is really just the screw that has fallen out of an otherwise intact hinge assembly or nosepad cup, and you still have the temple arm or nosepad ready to go back in, we recommend a small paperclip. A small paperclip will be made form a narrow gauge of wire that will go into the threaded hole without damaging the screw threads, and you can then fold the paperclip over itself lie a letter “J” and then over again to make an “O” and you should be able to wear them until you can get to an Optical Shop. Or you can try a toothpick like this fellow, who also gives out financial advise while repairing his glasses with toothpicks. Sorry folks, no financial advise on Framefixers.com other than reasonable prices on eyewear repair. Broken hinges are another matter, and a paper clip will not suffice. However, a pipe cleaner, wrapped around the body of the temple arm near where it broke off, and then around the frame edge, will at least get you going, rather than trying to drive with out vision. We see that tape is a frequent attempt, but even the famous Duct Tape just does not seem to want to hold for small eyeglass parts as soon as the wearers body warms it up. Depending on the dimensions of your eyeglass frame, and where it broke, a round plastic soda straw can work if you slide the temple arm into it, and then slide the open end over the hinged assembly. This actually works fairly frequently with today’s smaller wire-like frames, especially titanium minimal frames. Do not fix glasses with Superglue! If you leave this blog article with one lesson, it’s that you do not want to use is Superglue to repair glasses. Superglue, even when it is dry, very much like home insulation foam, gives off a corrosive gas. Not only will it permanently damage lenses, some people have an allergic reaction to it just being near their eyes, even when it is fully dry, that produces tiny water blisters on the membranes of the eyeball. This is one where you really should not take a chance. Try to find a non-chemical mechanical way to put your pieces together until a professional can make an appropriate and permanent repair. Shrink tubing is a very tempting choice for a temporary fix. We have without question seen well used and well affixed heat shrink tubing shrunk-wrapped on to a broken temple hinge, and we admire the creativity and skill it took to do it. However, we have also seen heat shrink tubing where the plastic temple arm caught in fire during the heating process, and the result are not pretty. Also, we have seen a heat shrink tubing attempt where the lens surface took a blister or burn from the heat of the flame. Once again we say…we admire a good creative temporary repair as much as the next person, but try something at room temperature that is not a chemical or glue, that holds things together without damaging the parts. If you end up deciding to get new glasses, maybe you can at least have a little fun with it like this guy and let a few thousand of your closest friends help you pick out your next frames! At least if you get your glasses repair with us, you’ll get a free eyeglass repair kit to make those minor adjustments safely! We are very grateful for the kind words written about FRAMEFIXERS.COM in the Ask Teri Column of The Wall Street Journal about glasses repair. Eyeglasses repaired by August Cornell at optical repair company Framefixers (before and after). While our main glasses repair and restoration work is applied to high end prescription frames from Cartier, Bulgari, Dior and other quality companies, we enjoy it even more when a purely design driven sunglass frame comes in worn by decades of loving wear. Vintage glasses require special TLC. Some of these leopard pattern wrap- around wearable art graced the models of Coco Channel, Dior or Versace in the 1950s through the 1980s, and now need everything from complete surface refurbishing to the fabrication of complete hinge sets made here in our shop for those no longer available. With the average eyeglass and prescription lens set purchase routinely running over $700, and our average repair running less than $70, we saved customers over two million dollars in retail prescription eyewear purchases in 2014 alone. We still will always make time for that unique Audrey Hepburn cat’s eye frame or Ray Ban Tom Cruise Aviator sunglass that places that iconic look back on the customers face along with a smile. Scratches on lenses, aka Scratched Glasses, are really best left up to a professional. The very surface of a lens is frequently the coatings. Only the finest of scratches can be removed from these gossamer thin layers. Plastic polishes in liquid form can be purchased from auto refinishing houses. These should be used only with a complete understanding of their grade of grit, and only with clean professional grade cloth to apply them. Generally, deeper scratches that require buffing wheels and consecutive grades of surfacing compounds should be left to a shop that does so routinely and knows exactly what the materials involved demand. Framefixers can fix all types of glasses. At FRAMEFIXERS.COM, we maintain a wide selection of testing chemicals to first determine exactly what the plastic is in an eyewear part we are attempting to resurface. Once again, even the testing is done in an inconspicuous spot so that any discoloration or reaction to the testing chemicals will not be seen. At this point, we move up to a higher strength of polishing by using paper or rubberized cloths that are available in numbered grits like 2200, 1800, 1200 etc. These are grits that will remove a deep scratch in plastic or in the plastic coating a metal eyewear component by removing more surface material. However, once the deep scratch is removed, the abrasion done by the higher grit material will has to then be polished to get the surface back to a glossy coat. Call for a free estimate today (1-866-FRAME-FX/1-866-372-6339). We can replace prescription lenses too. If you are determined to try to remove scratches from your lenses at home I’ve assembled the best advise possible. Having mastered some skill using a dry jewelry polishing cloth on plain metal an plain plastic eyewear parts from our earlier post, you may be ready to improve the scratched surfaces where the depth of the abrasions are too deep for a simply polishing. Even in these simple application, you need to be very careful to determine is the surface you see goes all the way down to the center of the abraded component eyeglass part. Sometimes, surface color like a glossy red may only be a thin skin over a base material of another color. This is why the test area technique is critical and must never be skipped. Notice that up to this point, we have only been working on simple solid colors in plastic and metal and only using dry fine polishing grades, and only on the body of the frame. Assuming that your scratch is in a high -relief area like the outermost corner of a frame front, and the scratch is deep enough to warrant more than a dry fine polishing cloth, you should acquire a very fine liquid plastic polish like those used to clarify headlight lamp covers. This swill require that you use a technique called “blocking”. A good quality thick body cloth will be stretched over a rubber or wood form and drawn tight. The liquid polish will then be spread on the surface of the cloth, and the polishing of the scratched area of the frame will be done in careful and deliberate strokes paying close attention to the area being touched by the treated cloth surface. This technique requires acquiring considerable skill before one has the balanced use of speed and strength to obtain the desired results. If you are a collector of eyewear, you may benefit from acquiring some “test” frame on which to practice before gong on to those which are more valuable. Good luck with your scratched glasses! Glasses take an amazing amount of abuse in modern life. Like most personal accessories they are subjected to indoor and outdoor environments, the presence of modern materials like stainless steel, tile and marble and granite surfaces in increasing varieties, and the hustle and bustle of rushing from car to office to home to dinners to the random abuse caused by pets and children. Today we will talk about removing scratches from glasses. Some eyewear owners prefer to simply hand their tired eyeglasses over to an optical professional that offers surface care. Unfortunately these are becoming more difficult to find, and many glasses wearers are looking for information on how to care for surface abrasions themselves. We will begin with the removal of scratches. Like many modern items, eyeglasses have become increasingly complex and costly. Here are a few basic skills. First and foremost, always test patch anything you are intending to do to an eyeglass frame in an inconspicuous spot before you try it anywhere that is more visible. The inner flank of a temple arm is a good spot to try because if you are unhappy with the results, chances are you will be the only one that knows about it. Let us begin with a simple metal frame, that has no added color or surface treatment. Perhaps it is mirror polished in the area that has scratched, or perhaps it has a brushed metal finish. The first thing to determine is what the actual surface you are looking at really is. Most plain metal frames, regardless of the treatment of the surface, has an additional clear coat on it. If this is scratched, what you are actually looking at is abraded plastic, not metal. Abraded plastic can be made clear and smooth again following some fairly simple steps. For a surface that you wish to make clear or glossy again, you should stick with the dry polishing clothes available in most department stores in the jewelry area. Purchase one of the common two-sided cloths that state they are for polishing silver or gold. The silver ones have a slightly more aggressive grade of grit powder in the darker side of the cloth, and will generally be better suited for polishing the cover finish on metal frames. Once again, start wit a test area. Even if the inner flank of a temple arm is not the spot you want to polish try doing that area first and look closely at the results. Sometimes you will need to use a form like a wood pencil inside the cloth to make the polishing surface contact the area to be polished. Slow and consistent repetitive strokes will work best. If there is a brushed grain, polish in the direction of the grain. Plain plastic frames with no surface coatings will respond about the same way as plastic coated metal . For removing scratches from glasses, stick with dry polishing cloths until you acquire the patience and technique required to bring the surface back to a uniform gloss. Have you ever wondered how Framefixers does spring hinge replacement? Watch our Youtube video to learn more! Eyeglass repair kits are perfect for those minor adjustments. We give a free eyeglass repair kit with each repair job! There has been a recent flurry of advertising surrounding the phenomenon of “Driver wear” eyewear. At FRAMEFIXERS.COM we receive inquires almost daily regarding this group of lenses. This phenomenon is not really new, although there are clearly new optical products within this category. Lenses, both prescription and non-prescription, that heightened the differentiation of detail at dusk pre-date the American Civil War. Patents for glass lenses with a yellow or amber tint sought to enhance the perception of details at dusk or early dawn existed in the 1700s. There were many questionable early claims for lenses that allowed carriage and horseback travelers to see better in foggy conditions. Clay shooters, aiming at orange colored clay target popularized the use of amber colored lenses from the 1930s to the present. Some, like Bausch and Lombs Ambermatics, were also photo chromic, changing in density as the sunlight increased or declined. Modern driver wear is center around the newer increased knowledge and ability of coatings to enhance the eyes’ ability to perceive detail in dim light. Simple yellow lenses have been further enhanced with coatings in the Vermillion and Orange range, that combine to sharpen detail much in the same way polarized lenses enhance the ability to see through glare and reflection. Many modern driver assisting lenses are in fact laminated multiple layers of polarized layers, bonded to photo chromic layers that darken with sunlight, and then bonded to color laminates like yellow, red and orange that intensify as dusk approaches and extended to detail perception ability of drivers in darkening conditions. Much of the “driver-wear” experience is subjective. One of the most important personal characterizes for any driver to evaluate is their own “squint reflex”. People vary greatly in their squint reaction to facing sunlight, and this fatigue producing phenomenon should be highly ranked for consideration when choosing lenses for the task of extended driving. One should also be aware that many modern windshields contain filers that will defeat many modern photo chromic lenses. Therefore, whether one is trying to reduce squint by shielding the eyes against light and glare, or enhancing detail perception in dusk conditions, be certain to take in to consideration the effect of your particular windshield on you choice of “driving lenses”. We are able to custom design driver wear glasses to meet your specifications. Many of our customers call us with questions regarding obtaining or repairing antique looking eyewear. This widespread interest has left many individuals with a fundamental question regarding whether to look for a genuine Vintage / Antique frame in which to place their current modern prescription, or to review the offerings of modern eyewear manufacturers for a Retro/Reproduction example. This can be a taxing dilemma as one can vacillate back and forth as to the merits of each. To assist in simplifying this question, there are some fundamental characteristics of each group to consider against you own personal needs and specifications. First off, how much use are you going to subject this eyeglass frame to? Will it be relatively gentle fine wear as you would with a vintage piece of clothing, or are you about to subject it to daily indoor and outdoor wear? If the latter is the case, then the modern units are your best choice. Second, what are your personal Optical requirements? Is your frame size larger than 44? If so, you may find your choices limited among the surviving examples of authentic vintage frames. Do you want to wear cable coil end temples? Most of the authentic antique frames will have these, and straight alternative temple arms may be difficult to locate. 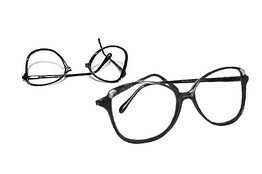 Authentic Vintage Antique Eyewear will not have spring temples, nor will it have modern silicone soft nose pads. These are modern accommodations that when missing will present problems long after the enjoyment of 100 year old frames wears off in daily use. The Internet can easily provide excellent photos of the Vintage/Retro looking eyewear available from modern manufactures who can offer you the size range, color range and component elements that can give you the daily wear enjoyment you seek. If on the other hand you are committed to obtaining and wearing authentic antique eyewear, be certain to developed a good working relationship with an eyeglass restoration facility like FRAMEFIXERS.COM to act as your partner in supporting your vintage interests. Eyeglass repair of nose pads are the most frequently submitted repairs resulting from “adjustment” that we receive at our facility. The eyeglass nose pad harps are the two small Sheppard crook shaped wires that are welded to the frame or embedded into the plastic of the frame that arch out and receive and hold the nose pads. These wires are frequently broken during “adjustment” and require a fairly complex repair of the frame. The middle number of your frame size, i.e. 48 / 20/145 refers to the nose bridge width. The first number is the frame size, and the last is the length of the temple arms. We of course remove the lenses and eyeglass nose pads, and weld or bond a new hard and pad assembly in place of the broken one. This is followed by white or yellow gold plating, or color lacquer applications to conceal and blend the repaired area back to the rest of the finish. When someone repairs eyeglass nose pads and harps, they should be using nylon-lined pliers that do not have a serrated face on them that would leave a mark. Modern gold plating is generally fairly thin and does not hold up to edged tools. Additionally, one does not want to have bare metal, or worse, bare metal with a splinter of metal pushed up from the surface of the harp wire in proximity to the skin on the nose where the bridge is worn. A proper tool and a properly trained technician should be able to make all the necessary adjustments to the nose harp wire without damage or difficulty. Eyeglass repair of nose pads attachment brings a whole additional set of problems to the proper replacement or adjustment of eyeglass nose pads. There are many types of mechanical methods for affixing eyeglass nose pads. The most common is the screw retainer type, where the nose pad has a stud with a hole in it that recedes into a receiver cup. The cup is then cross-drilled to receive a retainer screw, and the pad retention is complete. However, over tightening or overly strenuous removal of the screw can break off the body of the screw in the cup. This can turn a $750 dollar frame into a useless piece of metal and plastic if the screw body cannot be properly retracted and replaced. We have the drilling and threading machinery to do so and we perform this eyeglass repair several hundred times each year. Along with the dozen different shapes and millimeter sizes of eyeglass nose pads, there are also a series called “snap-in” pads that have a mushroom stud that is either snapped through a yoke, or slides into a question mark shaped harp end to retain the pad. Unfortunately these are even more delicate and prone to break with improper tool abuse. Fortunately, we have all of the modern variants on these snap-on harp arms and are able to replace them when they are broken. Keep in mind that your frame should only touch your head where the nose pads touch the flanks of your nose, and where the temple arm ends are cradled in your ears. If the frame size and bridge size are correct for your head and face, there should be no need for extreme relocation of the eyeglass nose pad harps, and you should be able to enjoy your frames securely and consistently for years. Remember to contact Framefixers for your eyeglass repair needs!